Confederacy, 1862, 10¢ Rose, White Third Spiked Ornament at Right, position 45, bottom margin single with full imprint of "Litho of Hoyer & Ludwig", Savannah, Ga. town cancel, clear to large margins, bright color, flaws including creases and small thins, F.-V.F. 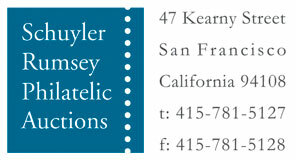 appearance, very scarce. C.S.A. Catalog No. 5-v3. 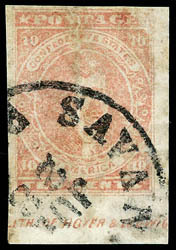 Confederacy, 1862, 10¢ rose, Shooting Star Variety and Shifted Transfer, position 14, Shifted Transfer at Top and Bottom, large margins all around, tied by indistinct cds on cover to Lt. Col. O.G. 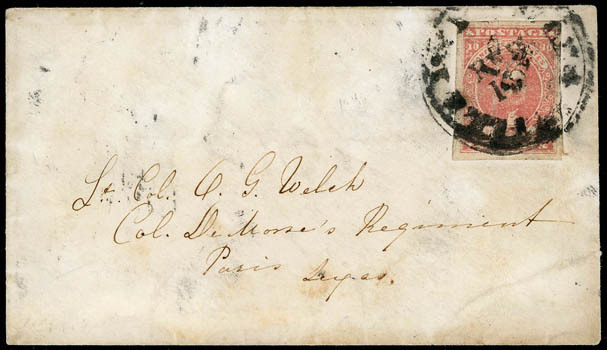 Welch, Col. DeMorse's Regiment at Paris, Texas; stamp with light vertical crease, F.-V.F. ; with 1999 C.S.A. certificate. C.S.A. Catalog No. 5-v4. Scott No. 5 var. Estimate $1,000 - 1,500. A RARE ON COVER USE OF THE SHOOTING STAR VARIETY. 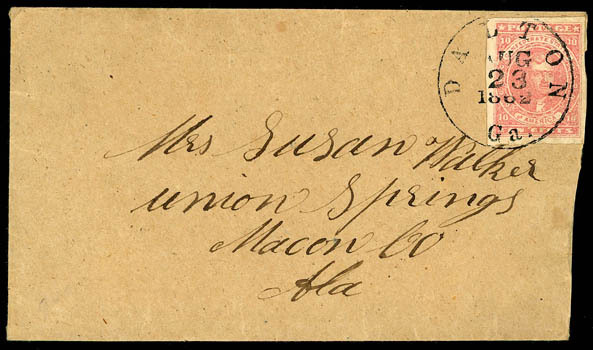 Confederacy, 1862, 10¢ rose, malformed "T" of "TEN", position 4, ample to large margins, tied by neat "Dalton, Ga., Aug 23, 1862" cds on pristine homemade cover to Union Springs, Ala.; slight cover reduction at right, Very Fine and attractive, a scarce on cover usage of the "ZEN" variety. Scott No. 5 Estimate $300 - 400. 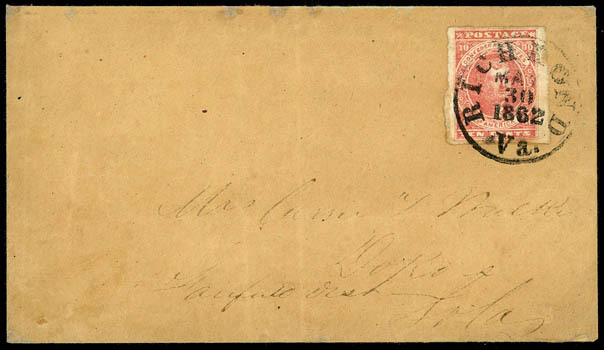 Confederacy, 1862, 10¢ rose, Six-Point Star Variety, four clear to huge margins, tied by "Richmond, Va., May 30, 1862" cds on buff cover to Fairfield Dist., South Carolina; cover with restored edge, Very Fine appearance; with 1973 P.F. certificate. Scott No. 5 var. Estimate $300 - 400. Sent the day before The Battle of Seven Pines, also known as the Battle of Fair Oaks, took place on May 31 and June 1, 1862, in Henrico County, Virginia, as part of the Peninsula Campaign of the American Civil War. It was the culmination of an offensive up the Virginia Peninsula by Union Maj. Gen. George B. McClellan, in which the Army of the Potomac reached the outskirts of Richmond. 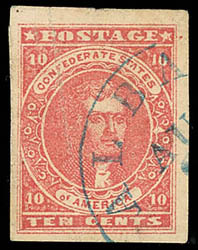 Confederacy, 1862, 10¢ deep rose, White Arrow Variety, position 45, large to huge margins, cancelled by blue town cds, light vertical creases, Extremely Fine appearance, a scarce variety. C.S.A. Catalog No. 5-v3. Scott No. 5 var. $500+.